Club Black Ice is located in downtown, in No 13 Balkanska Street, right bellow hotel Moskva. With concept between bar and club, this club is made for your enjoyment. During a period between 11 pm until the early morning hours, you can experience unforgettable moments in nightlife of Belgrade. Club Black Ice accommodates around 250 people. 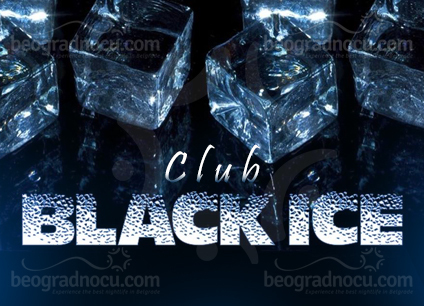 Club Black Ice is opened, for you pleasure, on Thursdays, Fridays and Saturdays. Here, you can expect friendly staff, ready to please you at any moment, impeccable service and of course the thrilled guests, are to blame for an amazing atmosphere in this club. Club Black Ice exists for you enjoyment, with affordable prices, unique interior and of course excellent club atmosphere. The interior of club Black Ice is decorated very simply, so you can have enough space for every move you want to perform on a dance floor. It’s extremely spacious and gives you an enjoy sitting at large bar, high black tables or black leather boots. The specific thing about this club is its acoustic, which is excellent and definitely one of the important factors for a great party. A various choice of alcohol and soft drinks is implied here, and we recommend you to try one of refreshing cocktails that Black Ice offers. Klub Black Ice is advised for all the people who know how to have fun, and different genres of music, such as domestic, foreign or folk. Here you can listen to the old hits of ‘90s, house music, commercial music, Hip Hop, R’N’B and even Salsa. Club Black Ice is ideal for all types of parties and the address Balkanska 13 is deffinetly right choice is you are looking to have some fun. Welcome to the place, where you will want to come back – club Black Ice.